I was never a fan of tofu. I think the problem is that in the west, it's often used as a meat, egg or dairy substitute. Scrambled tofu? Tofu panacotta? Tofu chocolate mousse? Wrong, wrong, wrong. But in China, tofu has a life of its own. It even has a whole supermarket aisle of its own. There are more tofu products here than there are cuts of meat at my regular supermarket. 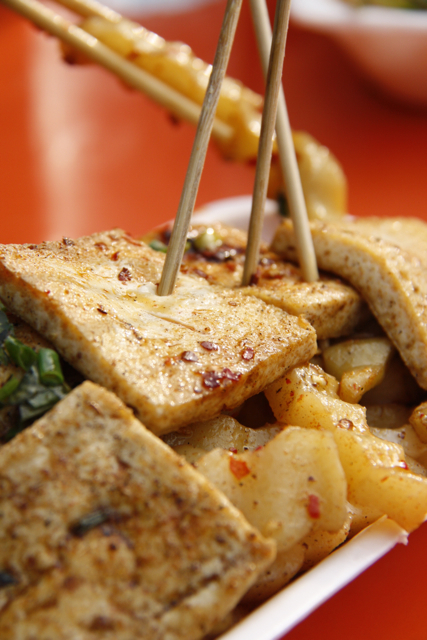 Accordingly, in Chinese recipes, tofu is given the respect it deserves, with dishes dedicated to bringing out the best of its characteristics, not designed to fool you into thinking that you could be eating meat. 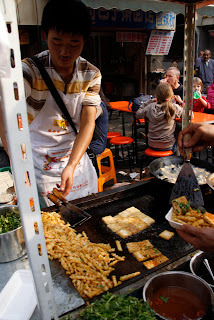 I often see street vendors selling squares of fried tofu, seasoned with chili salt. They come with long toothpicks so you can eat them without getting messy. This was something new though - tofu with chips! An east meets west stroke of brilliance. The crinkle cut potatoes were first deep fried in the street-side wok, then drained and tipped onto the grill plate to get really delicious, along with some chili flakes, chopped spring onions, and pepper. (That will be my family in the background, loking sceptical. But it only took one taste to win them over.) Yum! 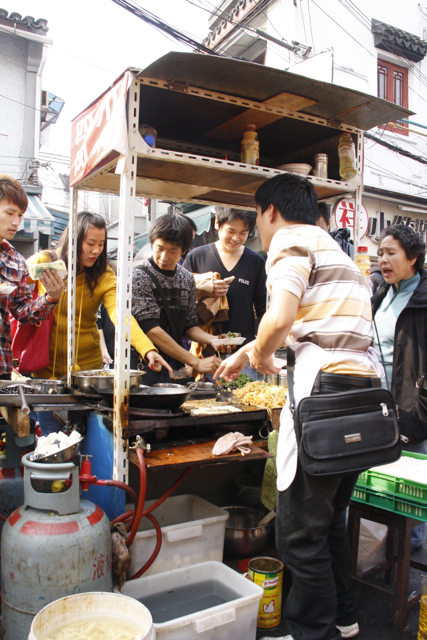 5 yuan (80c) per dish.